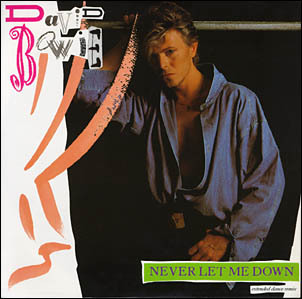 EDIT: This article was originally under the heading ‘Great Songs from Bad Albums’, but in the meantime I have been won over by Never Let Me Down – yes, it’s still one of Bowie’s weakest, but I’m very fond of it for the most part, so please be aware that my original dismissal of the LP as seen below is no longer how I feel about it. David Bowie’s 1980’s, more than Neil Young’s 1980’s, more than Bob Dylan’s, Paul McCartney’s, Eric Clapton’s…even the Rolling Stones, are the most notorious example of a once-great artist cashing it in and losing untold levels of credibility. The thing is, Bowie’s 1980’s material has plenty of great things in amongst the mediocrity, but I reckon the lamentations are more to do with how much Bowie lost as opposed to the actual content of the newer songs themselves. I mean, I wasn’t alive during any of Bowie’s golden years, but it’s safe for me to assume that the guy was a legend unparalleled in popular music. Then he lost it. The crossroads between good and bad is usually cited as 1983’s massive Let’s Dance album – which did feature a killer first side and the overlooked ‘Criminal World’, but was also a major jump into the mainstream which displayed a less interesting, less exciting Bowie. Would he tread even further into these commercial waters? Such fears were confirmed with 1984’s Tonight LP, a mostly dreadful misfire that not even the fantastic ‘Blue Jean’ could salvage. After that came Never Let Me Down, an unfortunately titled disaster that, while not as rotten as Tonight, was nevertheless a depressingly anonymous and weak effort from an erstwhile genius. The problems were the standard rock-fodder material, the pitiful attempts to recapture past glories (‘Glass Spider’), the empty production and a rap-cameo from Mickey Rourke of all people. The title track however, is the one to keep. Recorded separately from the rest of the album, it has a real spirit and joyous swing entirely absent from the other songs, and whilst no game-changer in itself, remains one of Bowie’s sweetest and fun tracks from the eighties. A simple song of love, sung in a honey-sweet John Lennon-style which sways and strolls with dreamy grace – listen to the way he sings ‘you danced a little a dance ‘til it made me cry’ in particular. According to Bowie, this was his most personal song to date, which is a bit weird because the radio-friendly sheen would be impersonal-sounding if it wasn’t played with such bounce. Love the chorus too – so very, very eighties, it hurts – at least it would if it didn’t sound so cool. Listen to the way the guitar struts and then the slap bass funks out for a second or two, and then Bowie’s lovely harmonica wails and sighs. I wish this song was on a better album. Ridiculously, it has also been neglected on Bowie retrospectives, only being available on various non-UK versions of his most famous best-ofs. By the way, it’s not about a girlfriend or boyfriend, it’s about a friend, in this case Bowie’s long-time personal assistant Coco Schwab, who was with him all through the horrors of his LA years and redemptive European period, when Bowie was at an all-time low personally (and all-time high musically). PS: Nice whistling on the outro too.